I’ve often turned on the TV on a Sunday night and watched at least part of a documentary on the historicity of the Old Testament. These documentaries always feature people with PhD’s in the relevant disciplines, who usually teach at prestigious universities. However, it does seem that most of these documentaries make ridiculous claims, using archaeology to back them up. These claims are wildly contradictory. For example, I have seen documentaries stating the Ten Plagues of the Book of Exodus were a myth. And then another stating they resulted from the eruption of Mt Thera on the Island of Santorini. One documentary claimed that David and Solomon were nothing but sheep herders with some influence; another claimed they were kings with vast empires. How is an amateur like me supposed to sort through all this competing information? Richelle has written this book to help ‘the reader discover successively the riches of information that archaeology provides.’ In my opinion, he does this and more. 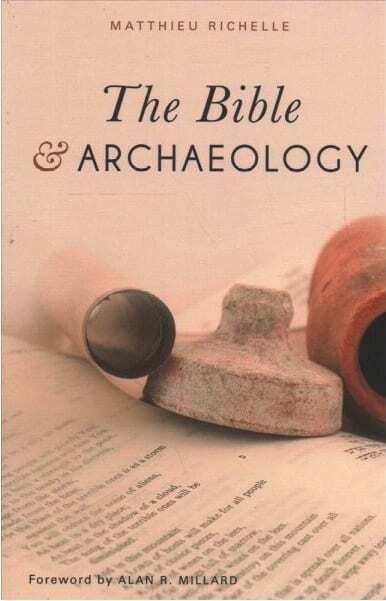 Well, Richelle’s accessible book The Bible and Archaeology is here to help, and it does it spectacularly. Richelle is no amateur archaeologist. He completed his PhD under the great archaeologist and epigrapher Andre Lemaire. He is clearly up to date with the arguments swirling around the archaeological community in recent decades, and has written this book to help “the reader discover successively the riches of information that archaeology provides, the limits inherent to this knowledge, and the manner in which we should compare it to the Bible.” In my opinion, he does this and more. The book is broken into six chapters. In chapter one, Matthieu expertly guides us through what archaeologists discover. He guides us through the identification of sites, remains and how archaeologists use the remains to reconstruct daily life, religious practice and the like of Ancient Israel. Chapter two is about inscriptions from the ancient Near East. We are introduced to various kinds of inscriptions (royal inscriptions, Ostraca, the Dead Sea Scrolls. etc.) as well as taking a look into the complicated task it is to decipher these inscriptions. In chapter three Richelle takes us through the limits of archaeology. He shows that most of the time, any use of archaeology that confirms or contradicts the Bible is only provisional at best, because it is nearly impossible to be certain that interpretations of data are one hundred percent accurate. Chapter four is worth the price of the book alone. In it, Richelle guides us through the six different ways that archeology of the holy land and the study of the Bible interact. Richelle states all the positions in such a way that their proponents would agree with, and he fairly shows the strengths and weaknesses of each position, before briefly outlining his position. The last two chapters deal with two current flashpoints in biblical archaeology: the United Kingdom of David and Solomon, and in writing the time of David and Solomon. In each chapter, Matthieu states the positions of those he disagrees with in a generous way. He then argues his points of view persuasively and clearly. In his arguments, he stays within the limits of what archaeology can and cannot prove. There are two minor points of critique from me. The first is I would have loved a chapter on the conquest of the Promised Land as described in the book of Joshua. It seems that most biblical archaeologists and secular historians of the Bible reject the biblical picture of the conquest on archaeological grounds, and I would love to read how Matthieu deals with these issues surrounding the biblical conquest. The second critique is that conservative scholars were underrepresented. In the ‘for further reading’ section, for example, the works of Kenneth Kitchen and Alan Millard are conspicuous by their absence. I also was surprised not to find Amahai Mazar’s The Archaeology of The Land of the Bible: 10,000-586 B.C.E or Amnon Ben-Tor’s The Archaeology of Ancient Israel, as they seem to be standard introductory texts in the field. However, these critiques are minor ones. This is a brilliant book, and it was a delight to read. It is so good that I have already given a copy of it away, and I have ordered more copies to give to anyone at church who has seen one of the documentaries that make outlandish and irresponsible claims. As I preach through 1 Kings in the coming year, I will be organising a reading group around this book as a way of helping my people see how archaeology interacts with the biblical text that we are studying. If you are a pastor or someone who loves ancient history, buy this book and read it! Richelle, The Bible and Archaeology, p 107. Hans Kristensen is blessed to be saved by grace alone. He loves calling Kate his wife, Emma, Niels and Elijah his children and Marsfield Community Church his church. Hans loves anything to do with guitar and basketball and is currently pursuing a bachelor of Ancient History with a focus on the Ancient Near East through Macquarie University.